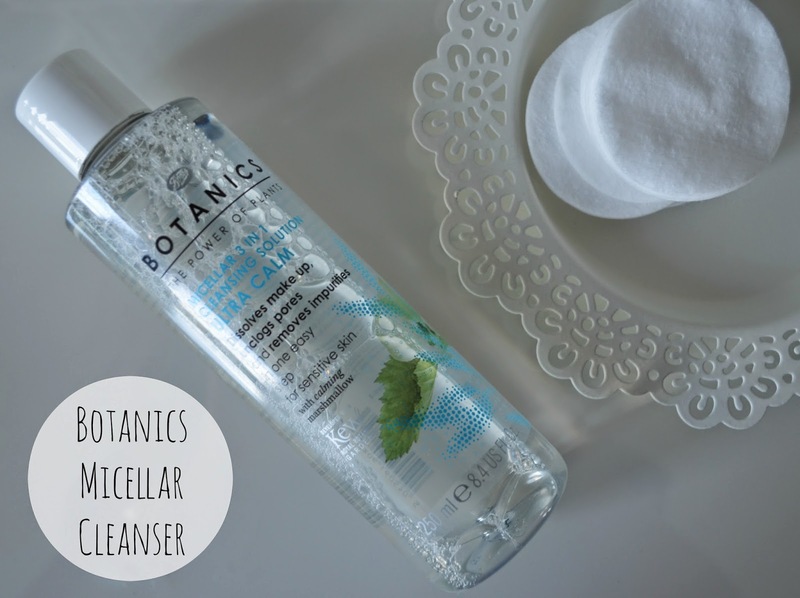 I do love a micellar water, as you may have seen me raving about about Bioderma's Sensibo H20 Micellar Water in my Evening Skicare routine Post and I have recently tried Botanics take: Micellar 3 in 1 Cleansing Solution Extra Calm, which at £4.99 for 250ml is half the price of the cult skincare product. Botanic's Micellar Water contains soothing marshmallow to help relive irritated skin and Linden flower extract to reduce redness. You can use Micellar water to remove your make-up, but I find it uses up the product really quickly, take a load of cotton pads and takes quite a bit of time. So I tend to uses a cream cleanser, then sweep the micellar water over the top to remove the final traces and unclog my pores before popping on my night cream. So how does it compare to my fave Bioderma? Well, as I don't have really sensitive skin, I can comment on which is better for troublesome skin as neither cause any reaction for me. I prefer the application lid of the Bioderma as it has a little hole so that you can control the volume you put on your cotton pad, whereas the Botanics is an open bottle and the first time I used it i spilt a load down the sink - whoops! I do also prefer the fragrance of the Bioderma which to me smells cleaner and fresher, but the Botanics smells good too. What Miscellar waters have you tried? Any reccomendations?